Bentley Systems Incorporated, the leading company dedicated to providing comprehensive software solutions for sustaining infrastructure, has released RAM Connection CONNECT V11 Edition Update 2. This software offers the best flexibility for the design of different shear, moment, braces, splices and base plates connection types. - AISC 360/341/358-16 update for all previously existing AISC connections. - Users now have the ability to change the application user interface language from English to Spanish or Chinese and vice versa, once the software is installed. - Documentation update. All RAM Connection manuals have been updated the latest features and GUI, including the tutorial examples. - Anchor placement in pinned base plates with HSS columns is validated to exclude positions inside the hollow section. - BS 5950 Moment End Plate connection was crashing when using mini haunches. This has been fixed. - Custom bolts per the Indian standard were not able to be created. This has been fixed. - Custom anchor configurations were not being saved properly when closing the Connection Pad. This has been fixed and now custom anchor positions are saved correctly. About RAM Connection. 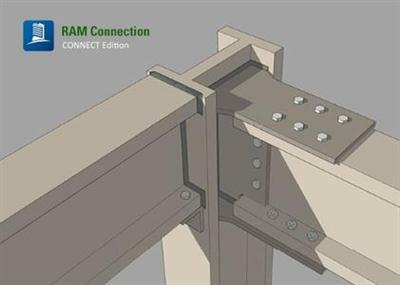 RAM Connection, a steel connection design application, is fully integrated with RAM Structural System, RAM Elements, and STAAD.Pro and coming soon with ProStructures! RAM Connection can check or design connections in seconds. RAM Connection provides comprehensive analysis and design of virtually any connection type and the designs include the tedious seismic code provision requirements. Workflows are optimized with integration of 3D design and detailing models and through the ability to customize the program. - Design and optimize any connection type included in the AISC specifications, including both ASD and LRFD. Connection types include shear and moment connections, braced frame connections, and column and beam splices. Seismic provisions for moment and braced frames are also incorporated. - A single connection can be designed and duplication of effort and errors can be minimized with the integration of 3D design and detailing models. Utilize your RAM Structural System, RAM Elements, and STAAD.Pro design models with RAM Connection for seamless connection design of your entire structure. - RAM Connection V8i includes base plates for almost any kind of column support. Choose between uniaxial or biaxial analysis, design the base plate per AISC 360-05 (additional seismic check per AISC 341-05 included), design the anchor bolts per ACI 318-05 appendix D in seconds, and get all the detailed reports and structural details you need for your base plate designs. - RAM Connection provides flexibility due to its easily customizable interface. Conform to your office standards by entering your own connection tables and rules-of-thumb. Modifying the standard connection databases lets companies incorporate their expertise right into the program. RAM Connection CONNECT Edition V11 Update 2 | 334.7 mb download links are provided by Extabit Rapidshare Uploaded Rapidgator Netload Bitshare Freakshare Letitbit Dizzcloud and more.